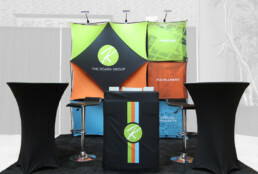 The RoArk Group needed a new display to serve as the backdrop for their presence at conventions. After some research we decided to go with an Xpressions snap stand that allows for quick and easy setup and tear down as well as portability. This will allow sales people to use the display at shows without needing additional people to help setup the display and transport it. An added bonus with the snap stand is that its carrying case can be used as a table for displaying product. This can be seen in the center of the photo which they used for business cards and product pamphlets. Designed while working at The RoArk Group as a Prepress Technician.